The Image Edit Wizard allows you to transform and apply effects to an image and save the result as a new image to use in EZGenerator. You can retouch, scale, crop and apply a wide range of filters to the image using the Image Edit Wizard. You can access this wizard by clicking the Edit Original Image button on the Insert Pictures dialog OR you can hold Shift key while pressing the Insert Pictures toolbar icon to access this dialog directly (works only if you select a single image). Please, note that we have a Video Tutorial available on this topic. 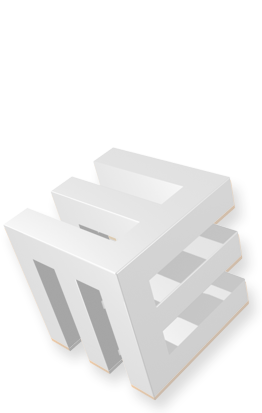 You can check it out at EZGenerator Tutorials. Use this screen to adjust the image size and crop it to a smaller rectangle. Maximum width & height (button set) - Sets the maximum width and height for the image. The image is scaled to ensure neither of these two dimensions are exceeded. Press the middle button to enter exact numeric values for width and height, or use the + and - buttons. Reload Original Image (button) - Reload the original image, so any scaling and cropping is discarded. 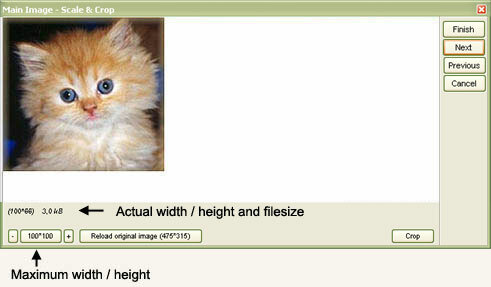 Crop (button) - Launch a window where you can crop the image to a smaller rectangle. After you adjust the cropping rectangle by dragging the cropping handles, press ENTER on your keyboard to save the cropping or ESC to cancel it. SCREEN 3 of the Image Edit Wizard contains several popular effects, common retouch filters and some special features, including adding text to your image. Colorize Effects (set) - Use colorize filters to change the mood of your image. The available color filters are purple, yellow, blue, sepia tone, green and orange. See Image Effects for a preview of each colorize filter. Retouch filters (set) - A set of filters you can use to retouch your image. See Image Effects for more information. 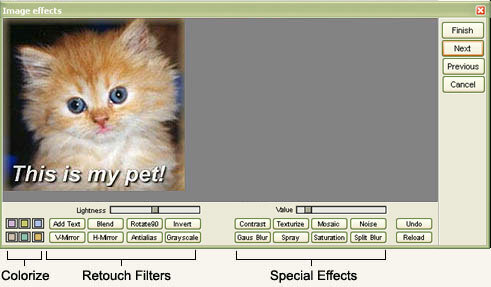 Special Effects (set) - A set of popular special effects, such as gaussian blur, noise, spray etc. The Value slider above the effects buttons allows you to set the "strength" used to apply the effects to the image. See Image Effects for a preview of each special effect. Undo (button set) - Reverts to the previous image state (before the last effect or filter applied). Reload (button set) - Discards all effects applied to the image. While EZGenerator itself supports many popular image formats some web browsers do not. SCREEN 4 provides you with options to pick a web-compatible image formats to save the picture. Use Original Image / Save As (switches) - This option allows you to use the original image file if you have not applied any effects and transformations. The option is disabled if you have edited the image, or you have accessed this wizard by pressing the Edit Image button in the Insert Images dialog. JPEG / PNG / GIF (radio group) - If you have selected to save the image as a new file, these options save the image as a JPEG, PNG or GIF image. JPEG Quality (number selector) - This setting is used if you have selected JPEG as a save file format. The higher the quality, the bigger the image-file. A value around 70-80% normally produces good quality and acceptable file sizes. PNG compression (number selector) - PNG compression vary from 0 to 9. The default PNG compression is 8. 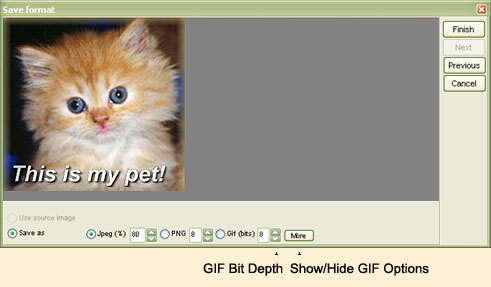 GIF Bit Depth (number selector) - GIF decreases the total number of colors used in the image. The number of colors is determined by the GIF bit depth (at 8-bit depth, the maximum number of colors is 256). The higher the bit depth, the bigger the image-file. If you don't use a lot of colors, lower bit depth will produce great results. Color Reduction (button set) - Select the color reduction scheme used to decrease the number of colors used in a GIF image (according to the GIF bit depth). Dither Mode (button set) - Because GIF images have a reduced amount of colors, you can use dithering schemes to reduce artifacts caused by the color-depth compression process, This drop-down menu provides several dithering modes you can experiment with. Selecting Nearest disables dithering.